BarGlobeWorld.com has been featured in Newsweek’s “Alexa Chung Picks a Few of Her Favorite Things,” where the British “it” girl “calls our Aristocratic Floor Globe Bar “really rad.” She’s right – it is! See our bar globe in Newsweek’s online version in The Daily Beast’s Entertainment & Fashion photo gallery, or pick up a Feb. 20, 2012 issue of Newsweek magazine. Until now the Newsweek magazine’s Want Page has only been accessible online, but the print issue has finally made it from the presses to the stores! In the Want Page, Chung says she’s obsessed with vintage globes,” and it’s an honor that she chose one of our bar globes to illustrate her obsession. This Italian-made 16th century replica globe bar is a true copy of an original piece and contains a museum-quality reproduction map. The floor-standing vintage replica globe mini bar comes in a choice of three colors: classic, safari and laguna. If you have an obsession with globe bars too, BarGlobeWorld.com knows the perfect way to satisfy it! Note to publishers: The articles published here were written by and are the property of BarGlobeWorld.com. If you wish to reprint or publish an article, you must: 1) publish it in its entirety without changing the title or content; 2) include all links; 3) include, in full, the information about the author/source, found at the end of each article, with links active. Back to School USA Sale | Color Circle Globes 25% Off! 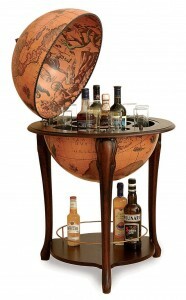 40% Off Italian Desk Globe Bar for Father’s Day! Happy Earth Day from Bar Globe World Blog! Copyright © 2011 BarGlobeWorldBlog.com. All Rights Reserved. BarGlobeWorldBlog.com is owned and operated by The Orange Basement, LLC. We highly appreciate every share!